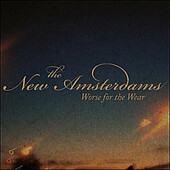 On their third full-length, The New Amsterdamns, lead by The Get Up Kids' Matthew Pryor, deliver a bounty of pop goodness, a well-worn, heart-on-the-sleeve collection of honest, heartfelt lyrics alongside glistening melodies that, despite their cheery appearance, often become downtrodden and melancholy with Pryor's vocals leading the songs. At times sparse, Pryor relying on his voice and acoustic guitar, while other times elaborated with lush production, Worse for the Wear can make you feel the way it feels. Whether you're into it for the hooks and love singing along to the sulky, depressed compositions, or come for the introspective treats here, the record will give you whatever you desire, and plenty more. I'll give it a B.